In his introduction, John Chambers, chairman of Cisco and founder and CEO of JC2 Ventures, singled out the three strategic issues topping the executive agendas for many years to come: innovation, customer experience (CX), and security. The enduring imperatives of differentiating through CX and innovating before being innovated are powerful forces driving the rapid adoption of assistants and bots. A few years ago, applications were mostly for customer service with Virtual Customer Assistants. Things have dramatically changed in two years. Conversica has been joined by new entrants such as Amplemarket and Saleswhale to create a mini category for B2B sales assistants. These bots engage with prospects in a highly personalized manner, helping sales in the early stages of the buyer’s engagement. Marketing has also become a key focus for conversational assistance. Pioneered by Drift and Intercom, conversational marketing is reinventing the online chat assistance model. It is changing the customer experience by making chat sessions persistent and preserved when flipped to other channels. These assistants have not only perfected the experience for website visitors but also for agents and employees who handle inquiries. Workers can respond to customer questions from their application of choice or using their smartphones. This convenience and customers' tolerance for asynchronous responses on messaging channels have allowed businesses to harness many more employees to assist customers. Bots coupled with a large pool of resources are making the channel responsive. This is in sharp contrast with chat, which is still leaving one out of four questions unanswered. The combination of self and assisted service at scale provides better answers as well. It is turning conversational assistance into the channel of choice online. This new assistance model helps customers whether exploring, purchasing or using a product, mirroring the continuous nature of customer journeys. Industry progress is enabled by the maturity of the underlying technologies, in particular, Natural Language Processing (NLP) and Natural language Understanding (NLU). The FAMGAs (Facebook, Apple, Microsoft, Google, and Amazon) have been investing massively in their development. They are competing to be the preferred digital entry point for consumers. They found conversational technologies critical to enable convenient experiences on any channel. A fascinating presentation from the AI Director of VIPShop, Huiyan Huang, reminded us that China is equally active in the space, in particular with its juggernauts Baidu, Alibaba, Tencent, and Xiaomi, also known as the BATXs. These large players are making their technology available as components either open sourced or aggressively priced. It is creating an option for enterprises to build their own bots. Autodesk shared its experience building its high profile AVA assistant by assembling such components. One technology making leaps and bounds is speech. I wrote about the speech renaissance a little more than a year ago. And yet, the performance of speech recognition has made strides since then. It culminated in May with the Google duplex demo at the Google I/O Conference. The performance was such that it made many people uncomfortable, feeling we were crossing the uncanny valley. Speech technology is opening up new ways for interacting with technology and intelligent objects. Siri Shortcuts became the highlight of Apple's recent IOS 12 announcement. It turns voice commands into workflows to automate actions and launch applications. There is a vibrant ecosystem of startups focused on enabling speech experiences, too. It is no surprise that two of the four main sponsors of the event are speech companies. Uniphore is not new to the market. It has assembled over the past decade a suite of speech solutions for assistance, biometrics, and analytics. VUI is a new entrant with a unique technology that enables voice-based interactions with e-commerce websites. 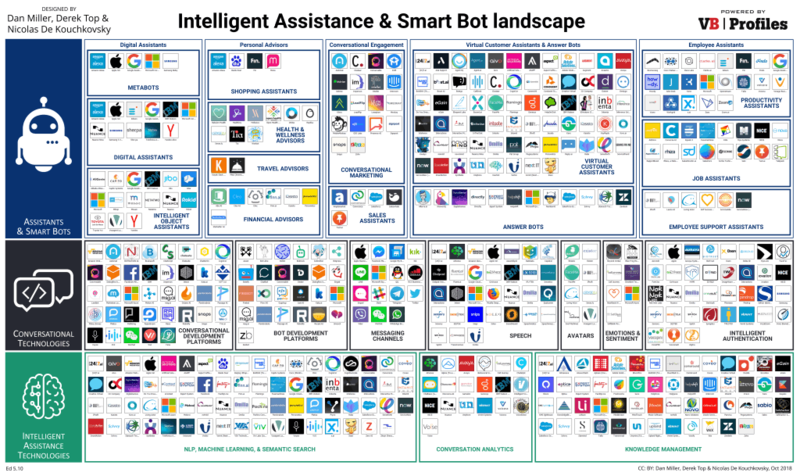 One of the trends I have also been writing about is the specialization of bots and assistants. The emergence of conversational marketing discussed above is part of that movement. Another domain impacted by specialization is employee assistance with two new applications blossoming. Job assistants guide employees for tasks or business processes. Employee Support Assistants help employees with issues such as onboarding or benefits. Alight Solutions, previously known as Aon Hewitt, won an award with its Lisa assistant for HR and healthcare plan questions. I will be discussing these trends and the conversational AI industry landscape at an upcoming ReadWrite webinar on October 11, 2018. Join me, it’s free!